Whenever you download a new application onto your computer, you need to keep in mind that you most probably download an entire variety of components that you do not expect to have. It especially applies to Creative.m2pub.com and all the applications that make use of this adware server. It is obvious that Creative.m2pub.com ads do not appear out of nowhere, so you are bound to have an adware or a potentially unwanted application installed your computer. Consequently, in order to remove Creative.m2pub.com and its ads from your computer, you need to uninstall the application responsible for it. 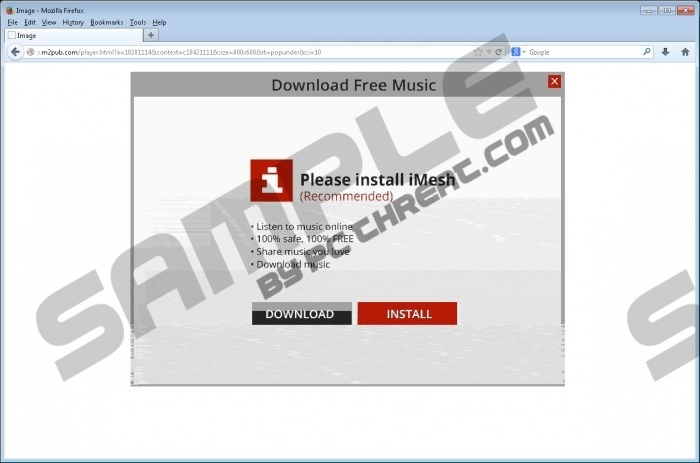 The pop-ups displayed via Creative.m2pub.com makes an impression that in order to view a particular website you need to download a media player. However, in our case, when we click the Update button we were redirected to yac.mx which is definitely not a media player distributor. It is a website for Yet Another Cleaner, which is a system optimizer and a potentially unwanted application. YAC download was initiated automatically just by landing on the website, so if you do not want any additional programs installed on your PC, you should be very careful about what you click on. More than one group of adware applications are known to make use of Creative.m2pub.com adware server. Based on our security research, the server is utilized by Conduit family of browser extensions and Lyrics adware family. It means that whenever you install anything related to these groups of software, you will definitely going to see Creative.m2pub.com ads pop up on your browser’s window. Since we have established already, that it is not wise to click the ads delivered via Creative.m2pub.com server, you now need to severe the source and get rid of Creative.m2pub.com for good. In order to stop the pop-up flow, you will need to uninstall the adware program that generates them. If you do not know which program is responsible for making use of Creative.m2pub.com server, run a full system scan with SpyHunter free scanner. Once the program in question is determined, uninstall it via Control Panel and then run a full system scan again to ensure that all the unwanted files have been terminated for good. Click Settings on Charm bar and go to Control Panel. Open Uninstall a program and remove adware application. Go to Uninstall a program and remove adware application. Click Start menu button and go to Settings. Select Control Panel and go to Add or remove programs. If you have any further questions about adware removal, please do not hesitate to leave us a comment. Quick & tested solution for Creative.m2pub.com removal.